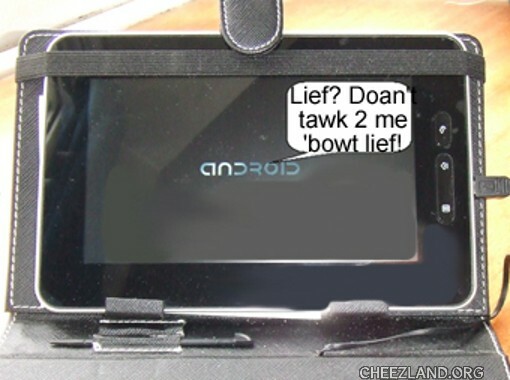 Brane teh siez uv a planit – still duzn’t werk rite! Call that job satisfaction, ’cause I don’t. Ohai an thx BF! Iz a hololidai weekend in TTI 2. We get 2 in Mai den nuffin til Awgust an teh wun affer dat iz Krissmuss. Duzn’t maek a lawt uf diffruns 2 me az Ai doan’t hab 2 werk. An PB’s awai dis weekend – him iz yooshoolee heer dis tiem. An haow’s dat payne inn awl teh diodes daown ur lefft syde? Imagine having your leg used as a wicket…. Ai hab 2 go shoppin fur noms – wuz 2 wet yestidai. BBL! Don’t let any vogons read you poetry and don’t panic! Ai kan hazza towel tew? Mus git tew teh stoar afore it gits tew wyld! And remember – don’t panic!!! O haow phunnee! Mai owldist kidlet plaiz inna jazz band, n deyz fayvrit mew-zik dat dey playded wuz “Paranoid Android” bai Radiohead! Haow fittin! And next time I’ll put the fjords in Africa, it’s just to cold in Norway…. Yay fer teh daze awf! Injoy s1f!